It may have only been the fifth game of the season, but on Friday night, a strange decoration was thrown onto the ice of the Air Canada Center. In Detroit, there are octopi, in Sunrise, there have been rats, but in Toronto, there are jerseys being tossed from the bleachers. It was the second time this season a disgruntled fan decided to donate his blue and white sweater to the ice surface. It began in boxing – throwing a white towel in the ring in order to acknowledge defeat. Trainers would do it so they no longer had to watch their fighter take anymore punishment. Maybe after witnessing only one trip to the postseason since the 2004-05 lockout, Toronto fans are starting to feel the same way. Let’s not forget that the one postseason appearance for the Leafs ended in one of the most prolific collapses in recent memory. Up 4-1 in Game 7 of the Eastern Conference Quarterfinals against the Boston Bruins, the boys in blue gave up three goals in the final 11 minutes of the third period – including two in the final 90 seconds – before Patrice Bergeron’s overtime heroics sent Toronto packing. I’m not saying it’s been an easy decade for Toronto fans – it’s been quite the opposite – but there are many other diehards who have had it much worse. Honestly, if you filter out the seven NHL franchises in Canada, the Leafs have had it much better than the Winnipeg Jets, Calgary Flames, or even the Edmonton Oilers. Of course, the latter two are on the rise thanks to a plethora of young talent, but that doesn’t mean the road to this point hasn’t been littered with potholes and speed bumps. At least the Leafs have a legitimate MVP caliber talent in Phil Kessel, and – perhaps more intriguing to the fans – they get to be in the presence of Elisha Cuthbert every home game, who has been married to Dion Phaneuf, the Leafs’ captain, since 2013. Anybody who says that the crowd doesn’t affect performance is off their rocker. Sure, professional athletes are programmed to tell the media that they ignore any recognition from the crowd – whether it be boos or cheers – but anyone who has ever been on the ice knows how much strain the fans can place on your mentality. As an away team, if you have turned the home fans against their own team, you have already locked up the momentum, which can be the difference between zero and two points. Looking back again to Game 7 of the Eastern Conference Quarterfinals in 2013 between the Leafs and Bruins, which was in Boston, the fans never turned on the B’s. This led to the Bruins buzzing the Leafs’ cage late in the game and eventually pushing them through to the next round. On Friday night, and down 3-0 entering the third period, the Leafs took the ice to a barrage of boos from the hometown crowd. Even after Mike Santorelli scored 21 seconds into the third period to bring the lead within two, the stagnant crowd subsided – if ever there was a time to try and rally the troops, it was then. Instead, the Air Canada Center stayed silent and the Leafs eventually lost 4-1. Sure, the fifth game of the regular season is a far different atmosphere than Game 7 of a playoff series, but there’s never an excuse to toss your jersey on the ice. Anyone who has grown up around hockey will tell you that there is nothing more respected than the logo. 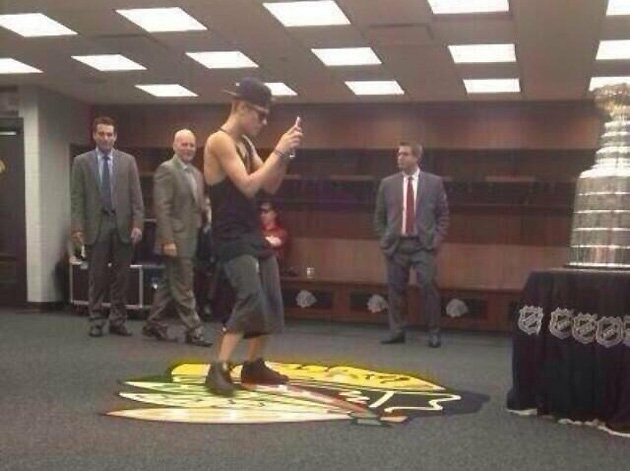 In my opinion, the fan that threw his jersey on the ice is no better than Justin Beiber standing on the Chicago Blackhawks logo last year. Yeah, you’re no better than this tool. Whether you understand the meaning behind the logo or not, there is one thing we can all understand, it’s five games into an 82-game season – it’s not like the Leafs haven’t won a game all year, either. Starting the season 2-3-0 is far from magnificent, but first off, what did you expect? And second off, two days after the jersey throwing affair there are still four teams in the Eastern Conference who are yet to win two games – get over yourself. Now I don’t want to throw an entire fan base under the bus because it was only a few people who have actually went to the level of throwing their jersey on the ice; however, if Toronto fans want to prove to their franchise that they’ll stick with them through thick and thin, put the poutine down and quit raining your stadium with boos whenever they take the ice. It’s easy to cheer when your team is winning, but true fans shine the brightest when their team needs it the most.